Based in London Premier Plating Works have been fulfilling the metal platiting requirements of London business since 1934. Since 1934 Premier Plating Works has supplied high quality industrial metal electroplating services as well as specialising in offering a wide range of bespoke colours for decorative coatings including antique finishes and coloured hues including blues, pinks and greens as required. Based in London we have established a healthy customer base across the whole of the UK serving main industry as well as specialist market sectors such as luxury yacht interiors, hotels, London houses and special events such as the olympics. 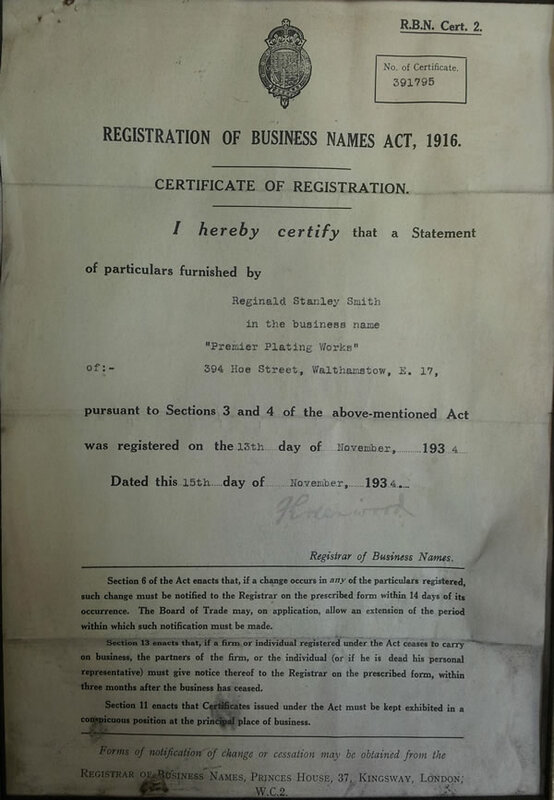 Below is a copy of our business registration certificate from 1934 in the name of Reg Smith, the father of the current director, Reg Smith.